It's a common mistake to try to use the Law of Attraction perfectly. When people discover the Law of Attraction, they usually become obsessed with perfectionism – they don't want to just make sure they're using doing everything right, they want to make sure they're doing absolutely everything it's possible to do. However, this quest to be perfect often prevents the Law of Attraction from working. A desire to do everything possible to achieve your dreams is commendable. It's a part of our very human nature. However, working harder is not a sign of success with the Law of Attraction. It's a sign of resistance. You see, the Law of Attraction isn't about being perfect. It isn't about doing everything right. It's about letting go and trusting. If you are focusing on perfectionism, you are attached to the outcome. A part of you is concerned that if you don't do everything possible, and do it absolutely right, you won't get what you want. Each time you look for more and more things to do to make the Law of Attraction work, you're telling the Universe that you aren't ready to receive what you've asked for. You're afraid that you won't receive what you want. And guess what? You don't receive it. The Law of Attraction is about HAVING FUN. Fun is never hard work. But how can you have fun if you don't have what you want? If you don't have the perfect job? your soulmate? more money? your ideal body? clear skin? You have to be detached from the outcome. You have to trust that the Universe is bringing you your desire. You have to have faith that what you want has already manifested, even if you can't see it in front of you right now. You don't have to be perfect with the Law of Attraction. It's okay to have a negative thought come up. It's okay to not visualize every day…or repeat an affirmation 1,000 times a day. The key to success with the Law of Attraction is to do your best, not to be perfect. As long as you're doing things right most of the time, you'll manifest your desire. Understand that the pressure of perfecting the Law of Attraction prevents your desire from coming to you. Each time you think, “Oops, I didn't do it right,” you're putting a barrier up that prevents your dreams from manifesting. 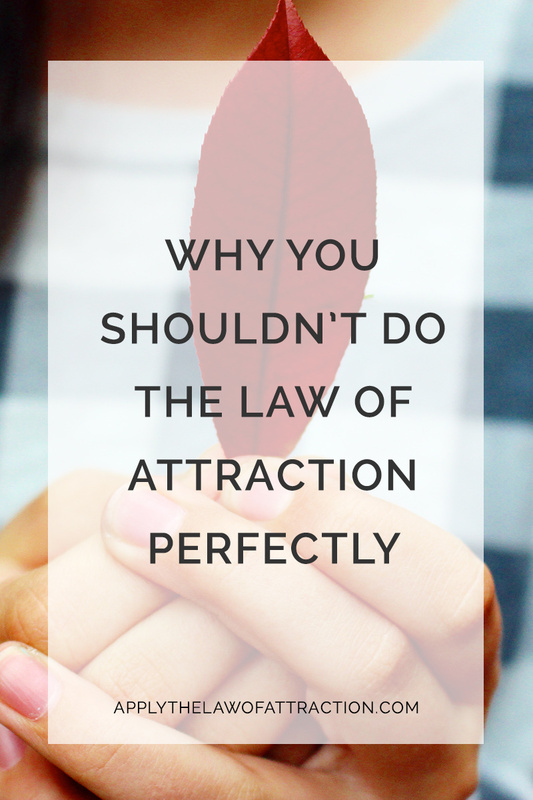 So where does the need to be perfect with the Law of Attraction come from? Often it comes from limiting beliefs like “I'm not good enough” or “I don't deserve to have what I want.” It can also come from hidden fears, such as the fear of abandonment. Success with the Law of Attraction requires letting go. You don't need to look for more things to do to manifest your desire. Trust that you have done enough. After all, the Law of Attraction isn't about the things you do to manifest your desires, such as visualization and writing down what you want. Those are just tools to help you achieve vibrational alignment with your desire. Release the need to find more things to do to make your intention manifest. Trust that the best thing will happen. The Universe has your best interests at heart. Be happy and enjoy your life as it is now. That will bring you results faster than perfecting the Law of Attraction. Your Crushing Vow to be Perfect! Great article ! – I felt as if it was about/ for me. I’m so guilty of overworking things at times, and am currently trying to adopt a more relaxed approach. Is there a point when you should stop doing anything (techniques) is something has not manifested?? Hi B – I’m glad you enjoyed the article! Great question about when to stop. If something hasn’t manifested, it’s a sign of resistance. You need to clear the resistance and raise your vibration. Pay attention to how you feel when you do the techniques. That can help you to identify areas of resistance. Wow 🙂 That is good to know, I’ve left the LoA so often because I thought I wasn’t doing it good enough, not having good thoughts, having bad ones and not visualizing enough. Thanks Helene! It’s really normal for people to give up because they put so much pressure on themselves and, thus, don’t see the results that they want. If you look at small children, you can see the ultimate creators in action – no stress, no pressure, just having fun and enjoying life. Brilliant article, I feel so much more empowered after reading this. I know I feel more stressed when I am trying to be perfect when practicing the LOA techniques, when really there is no need to be perfect because the intention of your desire is always there and thinking on it, I wouldn’t be stressed about being perfect with the manifestation of my desire, I would be joyful, so I keep that in mind now when doing any techniques. Wow! I’m pretty glad for this insight. I thought I must be perfect before I can receive my desires from the universe. Ended being depressed, fear came and I started doubting the possibility of getting what I wanted and guess what, I got the exact opposite of my want. So, I think I’ve recovered now. That’s why I don’t like your article Mrs, I love it. Thanks a lot. You’re welcome Uwem! We never stop having desires. As soon as one thing manifests, we find something else to want to attract. Everything is constantly evolving and changing. We’re constantly evolving and changing. We never need to be perfect, because we’re always evolving for our highest good. Thank you so much for such a wonderful article 🙂 I began applying the LOA only recently (about 11 days back) and while it’s been a lot of fun for the most part , trying to find those ” LOA people” who actually resonate with me and read/watch as much LOA stuff as possible, I have had my ‘damn-I -so-ruined-it’ moments every now and then too like all the rest of us. And I had been looking for someone who would just tell me that..it’s okay 🙂 Your words were just what I needed. I haven’t quite been able to …manifest my desires yet, but hey, I guess I am happy for the most part these days. And I know that’s the most important bit. To nurture our desires with all the Love in our hearts, with a strong belief that they are just around the corner(because we have a Universe that only wants us to be happy) and at the same time have as much fun as we can with the way things are at present. And adore ourselves of course! Love, Amrita. Hi Amrita – You have a great handle on how LOA works for having only been applying it for 11 days. I’m sure your reality will change to catch up to your vision quickly. Elizabeth, from all the responses it looks like your latest blog topic has really resonated with a lot of people. Keep up the good work!! I downloaded your kindle Ebook, Manifesting Love, this morning and read the whole thing while taking notes in 3 hours! Absolute gold! Thank you! I have a question and can’t seem to find elaboration on; If the ex of 10 years (who left 6 days ago to go stay in our rental house ) is incredibly adamant, and is “sticking to her guns,” has numerous reasons why the relationship didn’t work (blah, blah, blah), 15 minutes ago she just left our primary residence home that we share , after cleaning out her closet, still saying things like she needs to “get off the mortgage, get her boat, remaining items upstairs,” etc….Do these things-her being so adamant and insistent on moving forward with the dissolution of the relationship change the application of LoA or change anything about the LoA? I understand to pay no attention to our perceived reality, the ” goings on” if you will, as everything happens OFF our radar screen. I think I know the answer but would appreciate any comments. Thank you in advance. ps-I have been so cool, friendly, light, funny, happy and living my life since the very day she left. I had-for about one month- been already practicing the LoA for personal growth and happiness, not relationship stuff (maybe I should have been, lol) and have been doing remarkably well. I’ve surprised myself! This stuff is working so far! Hi Kathy – The techniques don’t change. It’s all about you, not about what she is saying and doing. It doesn’t matter if she uses the Law of Attraction. It’s a great sign that you’ve have been so light and happy! Right on! Thanks for taking the time to comment. I really appreciate it! Not sure if my previous posting has appeared anywhere I can’t find it :(…So here it is again (I apologize if you have replied and I haven’t seen it…). I have purchased some of those “how to get your ex back” books and I am even thinking of using a “relationship coach” but whether it is to sell me the book or the coaching services, they all say that I need to act NOW before my ex finds someone else especially because we don’t live in the same country and I am no longer part of her daily life. I have purchased such a book, and frankly other than telling me to use the No Contact rule for a several weeks, eat vegetables and get fit, and how sort of texts to send once the NC rule is over, it doesn’t help me in any other way. I certainly didn’t need a book to tell me that! Plus if someone really wants nothing to do with you, texts recalling the good old times (she broke up with me) might be a lot more annoying than entincing I would think, especially if they have started moving on….I saw some advertised on your website and I was wondering if perhaps giving the “how to…” another try is worth it, or if I am better off just sticking to LOA and reading your book as well as “The Map” that you speak so highly of, and leave it at that….? Tried tapping, meditation etc…Nothing. So what I am hoping is that in spite of not being able to detach right now, I can still attract a positive outcome…. You create your reality. Everything in your life now is based on what you have created in the past. If you want your future to be different, you have to change what you’re creating. If you want to change how you look, then work on attracting a fit body. If you want a relationship, work on attracting a relationship. They’re two separate things. If you want both, then work on both. If you only want the one, then focus on the one. This article may help you with detachment: Are You Having Trouble Letting Go? Ultimately, you need to decide what resonates best with you. If it’s a relationship coach, hire a relationship coach. If it’s the Law of Attraction, use the Law of Attraction. You’ll have the most success using what you’re most comfortable with. Chrisitian, I too, was wondering If should “make the investment” in Elizabeth’s e book. Ask yourself this: Is your relationship worth $10? If the answer is yes, then why are you still reading this, lol?! Go to Amazon and download it NOW! (you can even get a kindle app if you have pc). It definitely won’t hurt and I’m willing to bet it will only help. The letting go is not forget her and not care if she comes back (even though I think that would be best but it is not realistic for most) it simply means to ask for what you want then concern yourself with you NOT her. Stop being co-dependent, a blithering mess, calling her, texting, driving by, calling her friends to see what she’s up to, what she’s doing, who she’s with, etc. Stop torturing yourself! Take this time to learn that Chrisitian’s happiness DOES NOT depend on anyone else (it really doesn’t). Period! Learn you are strong, confident, charismatic, independent and happy-without her. If you’re “not there” yet, find even ONE great thing each day about you to start positive thoughts and feelings about yourself then keep adding to the list daily! This is imperative. Other people-regardless of their place in your life- can not be your source of fulfillment and joy (or this will keep happening until you do “get it”). Chrisitian, KNOW that until you do these things and really “get it” even if she does come back, the relationship WILL NOT change-until you do. Promise! It doesn’t matter how long she’s been gone, who she’s with, what she’s doing. Every single second, every single thought you think can bring her one step closer to a new & better relationship with you or push her one step farther from you. And my sweetheart of 10 years left 2-3 weeks ago and I feel good every day. Do I miss her? Most definitely, but it’s about me, not her. You must be able to think positive thoughts/vibrations all the time. This too is imperative! Like thoughts attract like thoughts. ie-LoA! Remember, even though she said this or that or did this or that, it’s not about what she says or does-it’s about you! Focus on you, change you and watch the magic happen. You’re doing better than you think you are! First, I am sorry that your long term relationship ended and I hope that you will reconquer her (if that is what you want of course) using your positivity and LOA. Thank you for you encouragements and kind words. Actually I was not debating about whether or not I should get Elizabeth’s book. That would be the book I would want to get! I was talking about all the other “how to get your ex back” books out there who seem to have been written by people who don’t seem to konw a great deal about relationships to begin with for the most part, and frankly the advise in them is laughable at most. But Elizabeth’s book is based on a concerete law of the universe. That I am willing to bet on. As for not concentrating on my ex, it is what I am trying to do. I am not texting her, nor calling her, or anything like that. We have had a long relationship together and have some affairs we must unfortunately take care of as we had made plans regarding certain aspects of our lives, but the contact is limited and distant I am afraid. I am doing all I can to concentrate on myself, but it is very difficult to just think of yourself as a sole entity overnight, when for several years you have been “we” and not “I”. It would be great it was possible to tame that factor, but it takes time…I guess it is easier for some than for others but I a working on myself and moving forward. I just wish she didn’t pop into my thoughts every single minute. That said with your and Elizabeth’s encouragement, I am sure it will be a little easier to move forward now. LOA here I come! I am soaking up all the LOA material I can possibly fit in my brain. After reading the “Why you shouldn’t do it perfectly” article last week, this question came to mind: Most LoA info indicates instant manifestation (or very fast) IS definitely possible and the only reason most who practice LoA don’t get instant manifestation is b/c their vibration isn’t quite in alignment with their desire. Ok, so if it’s not in alignment, how does one know what exactly is out of alignment and do you need to know what exactly is out so you can fix it? After all, you wouldn’t want to continue to do something wrong and preventing what you want from manifesting. Especially when everything else seems right on target-I feel happy all of the time, incredibly thankful, do my scripting and visualization religiously, read my ideal relationship list a few times each day, send heart love several times each day and speak ONLY the good things about her several times each day. Hummm…. And if my current state of mind is,”I don’t want her back “just yet” b/c the relationship would still be the same as it was before she left and time needs to pass for change to occur.” Could this be a self limiting belief that could prevent my desire from manifesting? I certainly don’t feel impatient and don’t mind waiting. And as another post said, thank you Elizabeth for answering the same questions over and over and for your patience and concern. It is a self-limiting belief. You have to understand that your relationship already won’t be the same. Things have changed. You’ve changed. She’s changed. If you believe time needs to pass, that is what you will create. If you think you don’t want her back yet, you won’t get her back yet. If you’re manifesting waiting for a relationship, you will manifest waiting for a relationship. If you are manifesting being in a relationship, you will manifest being in a relationship. Hi Elizabeth! I just had a quick question on negative thoughts! First I get that terrible gut feeling. Then I imagine what it would be like if everything I wanted worked out for about 1-2 minutes…if I get that long before someone asks me what the heck I’m doing..HA! Then I think about what is going well in my life RIGHT NOW and feel grateful. My question: is this a good way to going about changing my thoughts/reality? Or is it just me “squashing” my fears? Sometimes I tell myself “its okay to feel sad about ____” and let it pass and think about what I want instead and how good my desire makes me feel. That’s a great technique for shifting your vibrational energy to a higher level, which can help you manifest your desire. If you think you’re dealing with a deep seated issue that won’t shift (e.g., it keeps coming up, you think it could cause you to push your desire away after you attract it, etc. ), then you might have a deeper form of resistance to overcome. In which case, you might want to use EFT or other techniques in addition to what you’re doing. In general, remember you don’t have to do the Law of Attraction perfectly to achieve results. I’m unsure as to if it is a deep seated issue or not. It does keep coming up and I do find myself getting frustrated when it does come up but I firmly tell myself (often times, even out loud “STOP!”). I have been doing EFT as well as what I mentioned in my first comment. As to whether it would push my desire away once it has manifested into the physical…I believe that the negative thought will be gone when it does manifest as it has to do with something that makes me feel bad that is going on now. I usually choose to focus on my outcome rather than what is happening. I also know that the negative thought indicates that I’m still somewhat attached to the outcome…so I’m clearing that resistance with EFT. Brad Yates has a TON of videos on youtube for free. Although none of them are aimed at my specific resistance, I occasionally replace his words with my own words aimed at my own resistance. I just need to trust that it is all unfolding perfectly in ways I may not even be able to imagine. I am the sole creator of my reality. I love visualizing! And in other hand, visualizing is a kind of ASKing. Now, when we visualize a lot, does it mean we are reasking something (exact) to manifest??? Visualizing really shifts my vibration! I used to totally freak out whenever I had a negative thought or feeling. I wanted to share what I have been doing instead. When I have a negative thought or feeling I have been changing it to what I really want. Without stressing on it or getting upset. Just changing it and letting it go. At first it was a bit hard to do that, but now it is easy to do it. Is this a sign that I have let go of resistance? It’s a step in the right direction. It shows you’re working on overcoming your resistance. Your resistance will be gone when the negative thoughts and feelings are gone. I realize you are right. I have still been having a few of the “freak out” moments where it has taken me a few hours to pull myself back up. Still I do see it getting easier to overcome, and am seeing progress day by day. The resistance I am overcoming was created over a period of months of fears and worries from focusing on outward appearances. What started out as a bit of fear and worry built up until I really hit rock bottom with it a few weeks ago. I feel I was led to your site and have found the information very helpful. I have seen first hand the proof of that fears and worries do indeed have the power to create what you are fearing. My fears and worries created a warm/cold scenario for me with my soulmate. I am applying the techniques from your book and this site to change things, recreating my relationship with him. I am sure the Universe recognizes that I am working to resolve this because the signs I have been seeing are a lot more positive now than what they were a month ago. For example, I have been seeing happy couples in love, hear a lot about people becoming engaged or getting married, babies and such. Since it is what we do most of the time, am I right that the Universe sees the progress I am making? A month ago most of my thoughts were spent worrying and fearing. Now most of the time I am upbeat, positive, happy. The negative thoughts are occurring less as I said, and yep I am changing them right away, most of the time being able to just move back to a higher vibration, but like I said a few times it has taken me a few hours. Thank you! I have a tendency to feel guilty and beat myself up inside whenever I have really slipped. Remind myself there isn’t any need for perfection, etc. and that I haven’t messed up. I am overcoming the resistance! I have another question regarding overcoming resistance. After doing so good for a few weeks, the past two days I have been having a really hard time with the resistance. It has taken me the better part of two days to really pull myself back up. I follow the various ideas for overcoming it. Including self forgiveness. I would get to feeling good them plummel back down. To the point where I was thinking why bother trying when you aren’t seeing as many changes as you want. That is recognize as impatience on my part which is part of resistance. Those fears and worries of losing my true love are what led to all of this and I am seeing small changes as I have been working to overcome the resistance, but the hot/cold behavior from him gets to me sometimes. I decided today to try journaling in the third party sense. (He/she) Since doing so I feel relief but just numb. Like I have been through a war zone or something. I was wondering is this what happens when someone is working to overcoming resistance? You need to get back to focusing on having fun. Don’t try so hard to do the Law of Attraction perfectly, and that includes overcoming resistance. Do techniques that feel like fun and then let go. You are right. That is what I am doing. Have fun and let it go. Thank you again! Your article was awesome but I have something in my mind that doesn’t let me to overcome resistance. For example: Can LOA do ANYTHING? Can LOA give me everything if I use it in a right way? Am I worthy enough to achieve that dream? And all of them are my questions. Really, Can LOA bring us any desire??? Selen – You can achieve anything you believe you can. If you don’t believe you can achieve something or that you are worthy of achieving of something, you have resistance you need to resolve. You said we shouldn’t do the LOA perfectly. But is visualizing a kind of re-asking and an action towards our lack of that wish? I mean, if I visualize everyday, am I creating the feeling of lack about my dream? Or we can visualize everyday until our dream achieved? You can visualize every day. I have just read your book Manifesting Love. Finding it was a manifestation in itself as I have wanted a sign that I can use LOA to attract my ex back into a relationship with me, when everybody kept saying you can’t use LOA this way. So thank you so much for writing it! Anyway, my question is (and I guess I am asking to increase my faith and conviction that he is in fact coming back) if it matters how long you have been apart? The example in your book assumes the breakup is recent and that they left you. We have been apart for a year and I was the one to leave the relationship. The first few months I felt sure I wanted to move on because things had been so difficult. I then heard he still had feelings for me but was very angry and hurt by the breakup. After that there was some so so communication between us, that I am not dwelling on =) but since then, now about 7 months ago, he has refused all forms of communication. I have only let him know I am not angry at all but apart from that left him in peace. I have only been using LOA deliberately for about 1-2 months. I have gone from feeling absolutely miserable to feeling great almost constantly. In the past two weeks people whom I guess don’t know about us, have been referring to us as a couple and after not having seen him anywhere for almost a whole year, I bumped into him in the street. He seemed to be angry still though and didn’t even want to say hi. But I am assuming these are signs that manifestation is getting closer? So does it matter for how long you have been broken up and how angry the person seemed when you last saw them or is it only of significance if I let it be a problem in my head? It doesn’t matter how long you have been apart nor who initiated the breakup. Things are only significant if you think they are significant. You create your reality, so if you believe a person is angry and doesn’t want to communicate with you, that’s what you will create. If you believe a person is responsive to you and is seeking you out, then that’s what you will create. Thank you, thank you, thank you soooooooooooo much for such a wonderful article and sparing your such precious time to clear our doubts by answering our questions, it really means a lot, you are such a wonderful person!! refocus on what I really want! I have been reading over this post and the comments. Some days I have a fear or worrys come up regarding what I am manifesting. When it happens I end up feeling guilty. After reading your post on Perfection, I am wondering if perhaps I was trying to be perfect? I trust the Universe and it is almost like I feel guilty as though I let the Universe down by getting scared or worried. At the same time I realize everyone has that happens sometimes. I was wondering when that happens, rather than feeling guilty what should I do? How do I approach that? Stop Sabotaging Yourself and Start Believing! Hi.. I bought the kindle version of e-book of Manifesting love and I have read it like 10 times and I am still confused as I am not sure if i actually manifested my love or is it something temporary. My story goes something like this. I have been married for 8 years before I got into a relationship with my soulmate and everything was different, I was cheating on my husband and got separated stating some reasons as I wanted to be my soulmate and my soulmate was also married but was in a troubled marriage as his wife was cheating on him. He divorced his wife trusting that I will always with him, our relationship ran for an 1 year, i filed a divorce with my husband and was about to get divorce. Me and my soulmate were very insecure because of our ex’es, we could not trust each other and used to fight all the time, we could not communicate and that 1 year was a night mare, which made rethink my decision and after lot of pressure form family and friends I succumbed and got back to my husband dumping my soulmate considering the fact that i had a peaceful with my husband and wanted to continue the state though there was not anything between us. My soulmate did not give up on me and pursued me for 8 months, I used to get attracted to him always and ended cheating my husband again and again. I used to feel very guilty and used to push my soulmate away and this went on for 8 months. After 8 months 1 day he said he is going to get married and I was shattered but still said him to move on and I am not interested. The day when I got to know he is really getting married that is within weeks I told him to move on he got engaged and was about to get married. My whole world sunk and i could not think anything beyond him. Not my husband, not my family, nor society all I wanted was him. I did everything, falling at his feet, talking to his parents to stop the marriage nothing worked, he got married. Even after he is married he still loves me I can feel it, he says he loves me and cannot leave his wife as that girl has left everything for him and trusts him. he gets into shell sometimes and don’t talk to me and then I use heart energy and other tips you have mentioned to get him to talk to me, which always worked. I want him for myself forever, seeing him with someone else kills me. I have moved out for him, I want to marry him and have babies with him. I can feel a strong connection with him. Though I am happy with the talks we have, the occasional emotional love, but I want a meaningful relationship , I want to be his wife and not a mistress. I am trying everything in the book to manifest him. But I think there is some resistance that is not allowing me to get him completely. The resistance that he is married and am I selfish to get him back which means his wife’s life will be destroyed. But deep inside I know that we are soulmates and are made for each other, because when we started we were wreck and we have changed each other with love a lot. We have become better person after the breakups as we have realised true love. I want to wait and will do anything to get him back and i trust the universe will get him back to me. I don’t judge anyone for what they want to manifest. I can’t tell you if you’re being selfish. Thanks Elizabeth for not judging. I am great fan of your work. You have instated my faith in many ways and I am going to follow my heart with all it has. I am sure things will work out as I believe in myself and the articles you have out here have been strong reason for me to pursue my dreams. Please keep motivating. I have been following your website for quite a few months now and even left some comments, which you have responded to. I just want to say thank you so so much for this website and all of the help that you offer us. I remember how I use to get so anxious when I thought about my desire, and was completely full of doubt, but now I am much calmer and happier whenever I think of him — I even started seeing really strong signs that the relationship of my dreams is manifesting!!! Last time that I talked to my dear friend who I’ve been in love with for 7 years, he was looking at me in a way I haven’t noticed before and his energy felt a lot more vulnerable and emotionally open with me. I didn’t really think about it until after our conversation, and even though I have not heard from him since, it has really confirmed to me that my negative energy was blocking him from showing how he really feels !!! Thank you thank you Elizabeth!!! This is always my favorite article to come back to. When I first started using LOA intentionally in my life, I worried too much about taking everything way too seriously. I spent hours researching more techniques I could do and I got too scared to watch TV shows I used to love and listen to music for fear that it would influence me or that somehow I was allowing myself to absorb negativity from it. But now that I’ve relaxed, I see that’s simply not true. It’s all about having fun! I’m always learning to trust the universe more and more and know that the best is in store for me! I have read your book “Manifesting Love” and blogs too. I am applying all the techniques and feel inner happiness while applying them. I immediately change my negative thoughts. But I think I am thinking about them throughout the day. Is it over-doing in any sense? Am I blocking something?